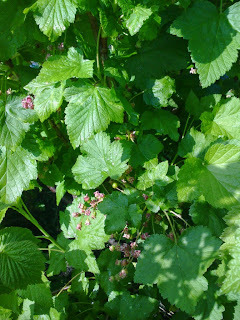 Despite the slow start, there is quite a lot of activity in the allotment and most of it is under cultivation. Eats at the moment are the very last of the leeks - they are getting a bit tough and the ends are swelling up into bulbs, a small bit of asparagus - picked very sparingly this year so as not to weaken the plant in the 3rd year of growth, some rhubarb and some broccoli. 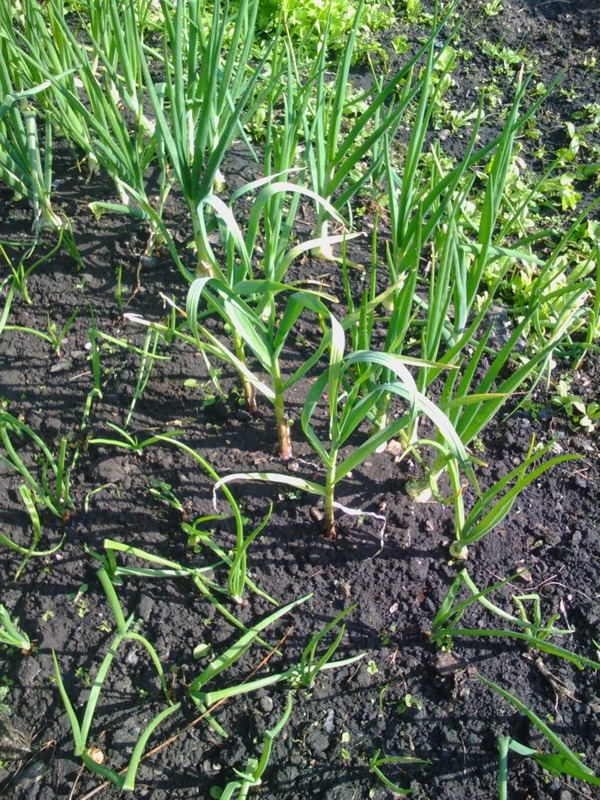 These are the overwintered onions and garlic. 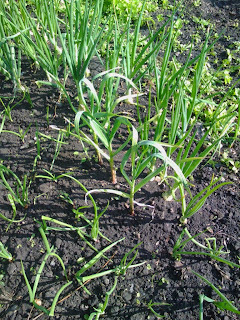 Overwintered onions - sometimes called Japanese onions - are planted in September as sets and are hardy enough to stand even the coldest winters we get here. 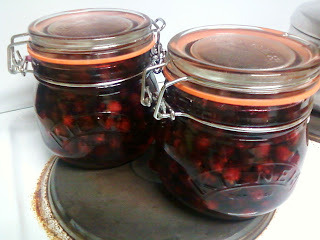 These will be ready towards the end of June. One of the garlics will be saved until next year, however you can just go to the supermarket, buy a garlic bulb, break it up, peel the papery skin off and plant! That's what we did when we first got the allotment! 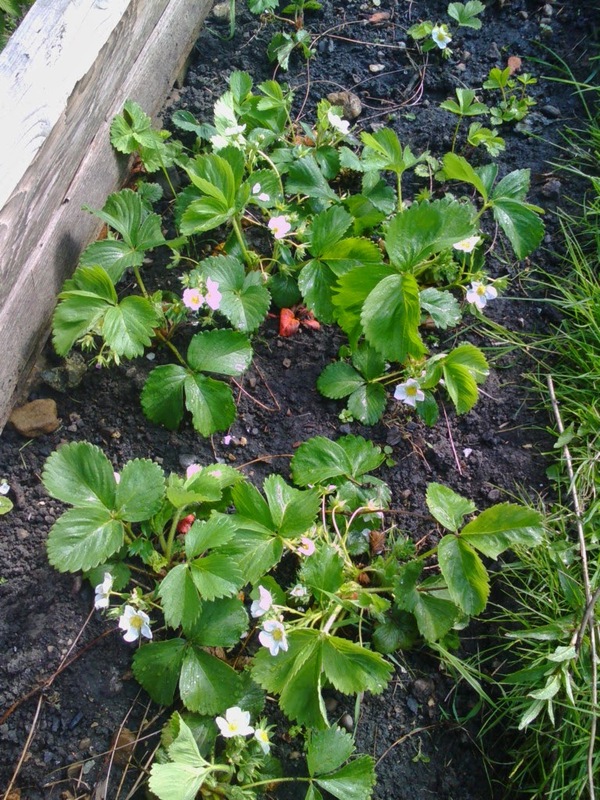 Here are the strawberries, flowering with one or two very small strawberries forming. In autumn last year, I dug out all the strawberry plants and runners, and gave the bed a really good weed, getting rid of as much of the invasive couch grass as possible. Then, putting in plenty of manure and compost, the best plants and runners (including some from the window box at home) went back in and certainly looking at them now it was worth the effort! Blackcurrants - these seem to grow more and more currants every year, which is good providing you have an infinite freezer and an lifetime's supply of Kilner Jars!